Alumni across generations remember them as backdrop to their UVM years, part of the campus landscape sure as the red brick of Old Mill or the tall pines on the Green. The late professor Paul Aschenbach’s “Tree of Knowledge” in front of Bailey/Howe, the “Lamentations” statues striding through the locust tree grove on central campus, the “Kindred Spirits” cones on the Fleming Museum terrace. But let’s come clean. 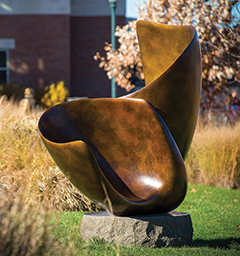 Rattle off a list of public art pieces at UVM, and you need not pause to catch your breath. President Tom Sullivan is changing that. He and his wife, Leslie Black Sullivan ’76, are art enthusiasts and serious collectors who met while serving on the board of the University of Minnesota’s Weisman Art Museum. In a higher education career that took him from Washington University in St. Louis to the University of Arizona to Minnesota prior to UVM, President Sullivan has gained a deep appreciation for the power of public art. Janie Cohen, longtime director of the university’s Fleming Museum, is President Sullivan’s partner on the project—identifying artists, works, and walking campus to scout just the right spot for a new piece. Sometimes that creates a certain academic resonance, the case with Gordon Gund’s bronze whale flukes in front of the Aiken Building, home of the Rubenstein School of Environment and Natural Resources and across Main Street from the Gund Institute for Environment. Other works nudge a new orientation to campus. Cohen smiles as she describes “Sparkle Pony,” a piece by alumna Kat Clear inspired by “My Little Pony,” a beloved part of many a Millenial childhood. 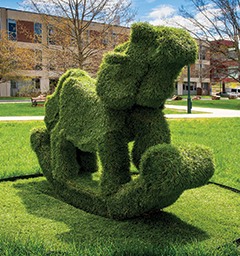 Cohen likens the work to “simulated topiary.” A metal frame upholstered in artificial grass, “Sparkle” is built for that art-world term “interaction.” To toddlers, whose campus childcare teachers have made the new sculpture a fieldtrip destination, that means climbing in the saddle. 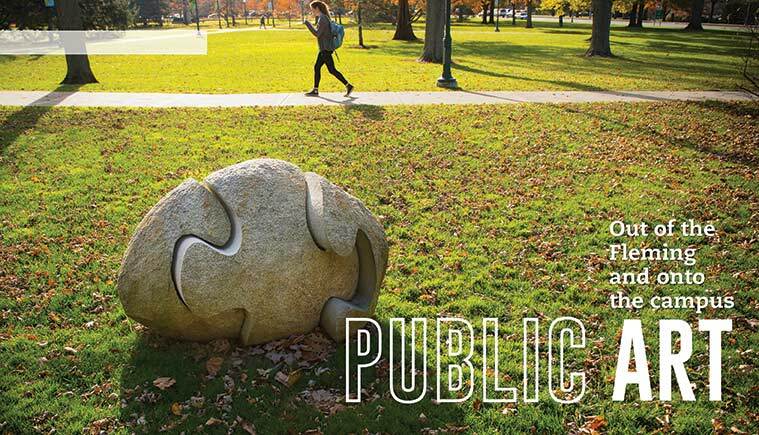 New York Times art critic Roberta Smith characterized public art as “a communal experience that is in some ways akin to movies or popular music in its accessibility.” And so it goes that each new piece of art installed on campus changes the communal experience of being a UVM student or alum just a bit. Case in point: A graduation day photo of Michael Arnold ’17 in cap and gown, sitting proudly, and perfectly deadpan, on “Sparkle Pony” glanced across the Twitterverse. “Ride that Sparkle Pony into the sunset!” his friend Joe Craig wrote. Michael may have been the first to grab this graduation day photo opp. He certainly won’t be the last. Gordon Gund’s interest in sculpture traces to his childhood, attending Saturday morning art classes at the Cleveland Museum of Art. He would study water color in college, become an avid photographer during four years in the U.S. Navy, and eventually find his way to sculpture when a friend introduced him to wood carving some thirty years ago. Gund increasingly turned his attention to art after retiring from a successful career in business and his family’s continuing philanthropic work, including support of UVM’s Gund Institute for Environment. The “Flukes” bronze at UVM is rooted in Gordon Gund’s experience helping to free pilot whales beached on Nantucket several years ago. Across the past twenty years, Lars Fisk has stretched the possibilities of sculptural spheres as a core element in his practice as an artist. Parking lot ball. Subway ball. Storage locker ball. Mister Softee ice cream truck ball, to name just a few. 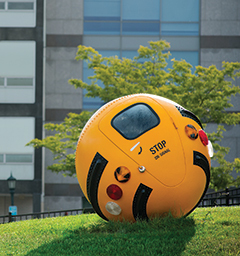 “Bus Ball”—complete with classic green vinyl seats inside, and tail lights that illuminate—complements the square lines of adjacent 1950s-era Hills Building and sits near the just-opened residential complex on central campus. Fisk’s career as an artist has included extensive stage set and festival design, working as art director with the UVM-born band Phish. His “Barn Ball,” featured on the cover of Phish’s 2002 CD “Round Room” is part of the Fleming Museum’s permanent collection, on display in the south lobby of the museum. Take a walk around Burlington and you’ll stumble across the diverse sculpture of UVM alumna artist Kat Clear—from a huge metal sewing machine and quilt suspended from a wall in the south atrium of the UVM Medical Center to quieter works such as a bike rack on lower Church Street. And, from the Davis Student Center to Foam Brewers on Lake Street, her signage and signature commercial work shows up all over town. Clear rattles off a list of the UVM artists/professors who influenced her—Bill Davison, Meg McDevitt, Kathleen Schneider, Frank Owen, Barbara Zucker, Ed Owre. “While they have almost all since retired, I am still in touch with some of them, which is truly a gift, in an artist’s or anyone’s life,” she says. Sculptor Richard Erdman has a long relationship with UVM, dating back to his undergraduate days when he worked with two legendary mentors—artist Paul Aschenbach, who helped him find his calling, and varsity ski coach Chip Lacasse, who helped develop him into a two-time All-American in alpine. Post-graduation, apprenticeship with stone carvers in Carrara, Italy, would also be key to Erdman’s development as an artist. Today, his work is on display in museums, and corporate and private collections worldwide. 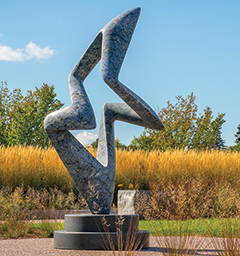 His monumental sculpture “Passage” sits at the entrance to the Donald M. Kendall sculpture gardens at PepsiCo in Purchase, New York. Carved from a 450-ton block of travertine, the 25- by 16-foot “Passage” is the largest sculpture in the world carved from a single block of travertine. “Areté Blu” joins Erdman’s “Primavera,” a gift of the Class of 2010, situated outside Jeffords Hall. Erdman also recently gave the university two more pieces, “Confluence” and “Belladona,” that will go on display at a later date.